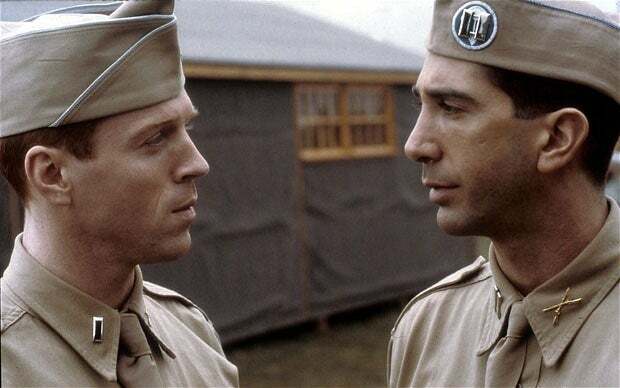 If I were a World War II officer, I would apparently be the equivalent of that character that Ross from Friends played in Band of Brothers a.k.a. Sergeant Completely Incompetent. Friends got really dark before the end. This is the season where Ross went to war and was grossly incompetent at his job. I come to this realization pretty early in my demo of Blitzkrieg 3. I've got three routes for infiltrating the enemy base—two bridges and then a long, forested lakeshore that's needlessly circuitous. After sending a few troops to scout the long way, I get cold feet. "We'll just go across the main bridge," I say, ordering my troops to cross. Oh wow, who could have predicted it was a trap? My tanks are stuck halfway across, thanks to a row of tank traps at the other end. Anti-tank rounds rain down on the bridge, wiping out most of my platoon in seconds. A few straggling infantry try to take over the base, but machine gun fire rains down from multiple pill boxes. They're massacred. "Well, that was short," I say. I think the developers watching me almost cried. Hell, I almost cried. Old franchises never die. They just sort of wait around in the shadows until someone says, "Hey, maybe we should make another of those." 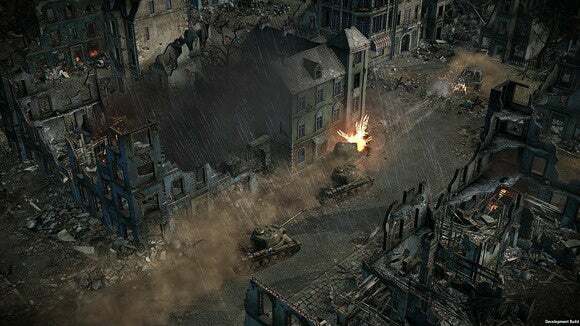 Case in point: Nival is making Blitzkrieg 3, a follow-up to the studio's 2005 real-time strategy game Blitzkrieg 2. Blitzkrieg 3 has its work cut out for it, though. 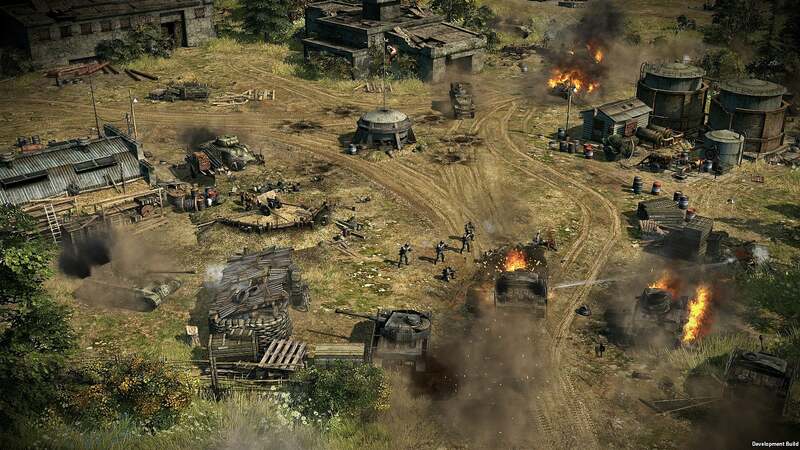 The landscape's quite a bit different in 2015 than it was a decade ago, with both Company of Heroes 2 and Men of War vying for control of the "World War II RTS" market. Not to mention the fact that there are fewer RTS games than ever, as the genre is seemingly in a lull. With both those facts in mind, I went hands-on with Blitzkrieg 3 recently at a demo event and then went even more hands-on with the game at home, courtesy of a pre-release build. I can pretty much only discuss the multiplayer, as the singleplayer wasn't shown off. The sum total of facts I know about the singleplayer? There are three campaigns, representing three different "blitzkriegs"—the actual German Blitzkrieg, the 1943 American push in Italy, and the 1945 Soviet push for Berlin. Nival branded this an MMORTS when I first arrived, which is sort of an odd way to put it. When I hear MMORTS, I think of something like Total War: Arena where we'd have massive battles consisting of thousands of troops, all directed by different players. That's not Blitzkrieg 3. Instead, it's surprisingly similar to Jason Rohrer's indie game Castle Doctrine. Or like an RTS version of Forza's "Drivatar" concept (without the stupid Drivatar name). Basically, it's asynchronous multiplayer. When you start the game, you choose one of the three factions (American, German, Soviet) and are given a base. This base consists of a headquarters, a barracks, an engineer post, a fuel depot, and a warehouse. You want to defend your base. Maybe there are two roads leading in—you could set up pillboxes on each road, throw a few tanks in the woods, garrison some basic infantry in your base buildings, and toss an anti-tank squad near the fuel depot. Each of these units come at a cost, of course. Units drain fuel, while static defenses (like tank traps or barbed wire or pillboxes) cost supplies. 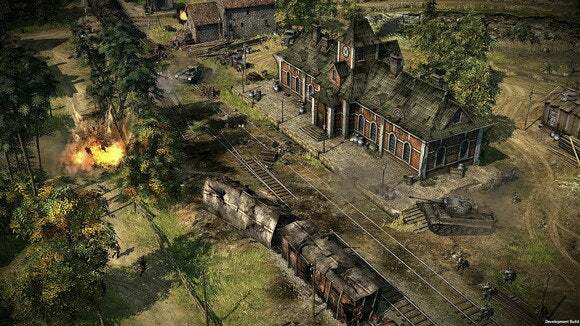 Your warehouse and fuel depot can be upgraded to hold more fuel/supplies as you get later in the game, your barracks can be upgraded to buy new infantry units/tanks, and then there's your army itself which you'll be adding to as the game goes on. Whenever you run out of supplies, the easiest thing to do is go attack another base. This is what I was doing in the introduction when my troops were so mercilessly gunned down. As you might have guessed, these "other bases" you're attacking are also built by players. Other players are cunning. Other players are much better at this game than me. Other players are assholes. I hold all three of these things to be true. Blitzkrieg 3 's asynchronous multiplayer is basically a simple, intuitive level editor combined with traditional multiplayer unlocks. And you don't need to worry about "offensive units" versus "defensive units" or anything like that. If you buy a unit, it's available to guard your base and assault someone else's base simultaneously. It's an interesting mode. Base building is particularly fun, trying to imagine what the enemy's going to do. Will they come up the road, or will the infantry end up stalking through the woods? If I put this anti-tank unit here will it ever see tanks, or will the tanks take this other route? The game will offer replay videos of others attacking your base to help you strengthen your defenses, though unfortunately Nival says they won't offer any sort of heat maps at launch. But does it play well? That's really the question here. It's a sequel to a decade-old game and... well, Blitzkrieg 3 plays like a decade-old game. That's not all bad. On the one hand, it's fast-paced and responsive. There are also a plethora of units to use, each with its own strengths. I was fairly amazed at how fast mismatched units can get destroyed. For instance, a pillbox can wipe out entire ranks of infantry in seconds if you're not paying attention. Ditto for anti-tank rounds. The game moves fast, and it's unforgiving of mistakes. 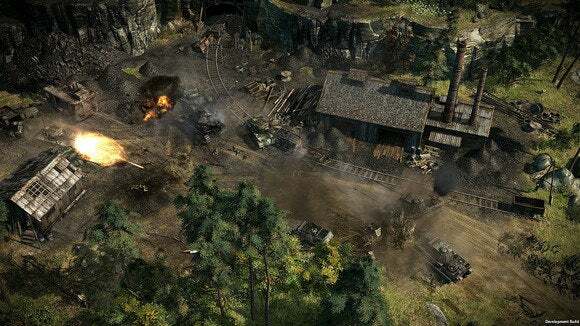 I did miss some innovations from Company of Heroes, though—particularly, getting in cover. Yeah, getting in cover makes Company of Heroes a slower-paced game. It's also realistic. Seeing a group of infantry stand in the middle of a field firing at a tank because they're too stupid to get in cover behind some trees is a bit frustrating. Forests do give a passive benefit, but you're never directly ordering troops to stand behind trees or anything like that. Overall, I'm enjoying it. I honestly think Nival is smart to show off the asynchronous multiplayer first because it's probably the feature that has the most promise. It's essentially an infinite supply of custom maps, crowd-sourced from the user base. Infinite replayability. 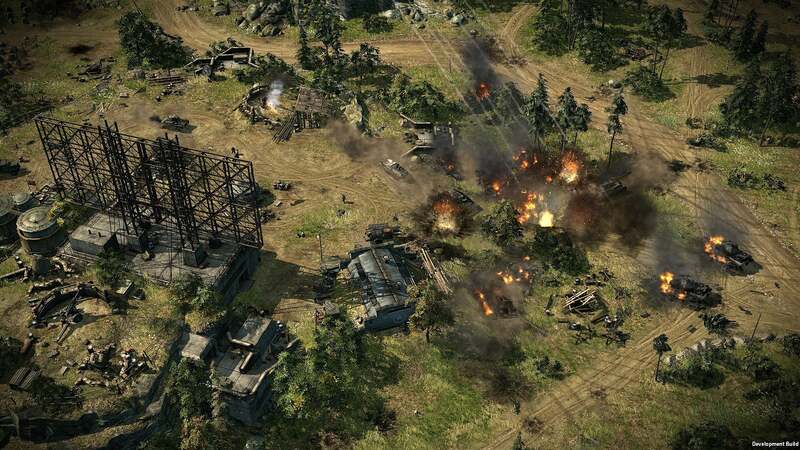 Whether it can compete with Company of Heroes and Men of War? We'll need to wait until the final game comes out to know for sure. There are definitely some issues right now, particularly with pathfinding. It's early days, though—the game's set to go into closed beta sometime this spring, so it's a ways off from release. More details when we know them.